The Football Adventurer: Where to get "Whatever happened to Tina Fillery?" Craig Easton - Captain of Southend United, formerly with - Leyton Orient, Dundee United, Livingston, Swindon Town and Scotland Under 21 International. Brian brings back happy memories of time spent standing on the terraces watching my local team Airdrieonians. His passion for football at any level has to be admired with his love of the game and his family often being one and the same. The book has certainly been appreciated on the team bus during long journeys to away games with the author no doubt being a lot more familiar with the opposition grounds than many of our current squad. He proves that you don't have to follow a Premiership side to experience all the emotions that football can stir and his humorous and heartfelt stories will be loved by both fans and players alike. game shines through - as does his love for his family. An interesting and unusual book written by a football fan obviously with passion for the game at all levels, and who can transcend the normal barrier of one club blindness. The book is a tribute to the author, his family and his personal football meanderings, which combine to make a book well worth reading. What a great book Brian - this is what supporting your team is all about, you have brought so many happy memories to mind. Supporting your Club through both good and bad times with the excitement, passion and tingle at the start of each season with the added fear and tingle of the drop after the first three games - how we love our Club! I read the first edition of this book and enjoyed the variation of stories and the quality of writing. Brian, although somewhat through blue tainted glasses, is a proper football supporter not one of the new breed that take success at their respective clubs for granted. His stories about Tony ( his father ) touched all that read them. But the humorous side of the book stands out as the true testament of this book.... you will struggle to believe the Scottish story but trust me its true !!! "Many football fans have written books to recollect their experiences with the beautiful game, but few have captured the essence of what makes us turn up every Saturday at 3pm as well as Brian Jeeves. 'Whatever Happened To Tina Fillery?' 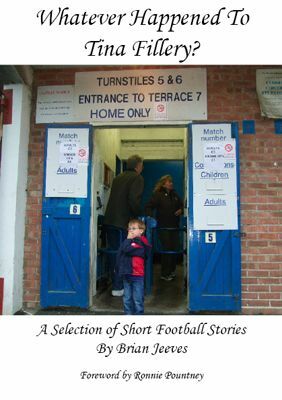 is a must read for anyone who has ever passed through the turnstiles at a football ground, with stories that are so easy to relate to that they jump off of the page." A rare glimpse into the real culture of football - not the cliched interview, or the endless pap of mainstream coverage, but an endearing insight into the obsession and angst that the beautiful game generates in people who truly love football. From Stranraer Reserves to throwing away a 6-goal lead, via Germany, Brian encapsulates what playing, watching and being lost to football can do to otherwise sane people. Essential toilet reading. As a bloke I can think of no higher compliment. As a Southend United supporter, I tend to read any book that is even slightly related to the football club. So I enthusiastically bought my copy of this book as soon as I could and started reading it straight away. At first I was a little concerned as the book did not seem to spend as much time on Southend related material as I had envisioned. However, I soon forgot about that as I got drawn more and more into the stories. This book gives an insight into the relationship between the author and his love for football. It examines the impact to which such a love for a sport can have upon the relationship with others and the sacrifices a person is willing to make to feed his addiction to the game. All of this is done through the telling of humourous and thought provoking short stories taken from the author's own experiences.